What can you do to help your clients? What are you doing that is strengthening your attorney client relationships? Look for opportunities to assist them. In this issue of Iyer’s Insights Pat shares some secrets about how to build strong attorney client relationships. Get an instant business plan so you can be your customer’s hero. 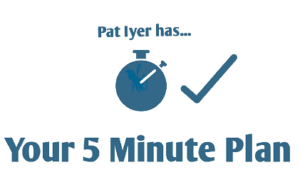 Pat’s 5 Minute Planners help you focus on what is important to an LNC business. Nothing like this exists elsewhere. Get 7 of Pat’s 5 Minute Planners for $7.00! Order your 5 Minute plans at this Link http://lnc.tips/5minuteplan and use the code Listened to get 25% off. Pat Iyer has been a legal nurse consultant since 1987. She built a successful LNC business that was filled with loyal attorney clients who returned over and over with cases.